Say It with Us: SIMPLE & FIT! 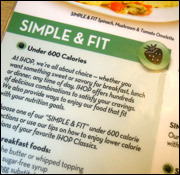 Menu items marked Simple & Fit have less than 600 calories each. And while not everything is a good choice (580 calories and 24g fat for fruit crepes seems kinda high to us! ), the S & F symbol does help to steer you in the right direction. 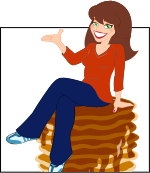 IHOP also offers Simple & Fit tips to customize any order: Hold the butter or whipped topping, swap regular bacon for turkey bacon, get sugar-free syrup instead of standard syrup, swap eggs for egg substitute, skip the cheese or ask for less, etc. Great advice, and it's nice to know they're so accommodating! Fruit and oatmeal go together like bacon and eggs. (Keep reading for your best bacon-n-egg bets!) This hearty b-fast bowl has a good amount of fiber and a nice amount of protein... Not a bad way to start the day! Great, great, great option! You get scrambled egg substitute, two strips of turkey bacon, whole-wheat toast, and fresh fruit. A complete breakfast that spares you the excess fat without leaving you feeling deprived. A bowl of fresh fruit topped off with low-fat strawberry yogurt and some granola sounds delicious! And judging by all that fiber and the low fat count, we're guessing it's heavy on the fruit and light on the granola. Love that! Two slices of whole-wheat French toast topped with slices of banana. Plus scrambled egg substitute and two strips of turkey bacon. This is a good option if you're craving a substantial meal with all the fixins! What makes these omelettes "Simple & Fit"? They're made with egg substitute (YAY!) and served with fresh fruit instead of fatty b-fast meats, potatoes, or bread items (DOUBLE YAY!). Features mushrooms, green peppers, onions, and roasted tomatoes, plus it comes with that fresh fruit. NICE. In addition to the obvious (spinach, mushrooms, and tomatoes), this has onions and Swiss cheese. YUM!!! This is kinda high in fat, but if you need cheese and meat in your omelette, this is the way to go. You can always request "less cheese" if you want to save some fat and calories. A basic combo of scrambled egg substitute, two buttermilk pancakes, and two strips of turkey bacon. This is a good option if you're craving classic pancakes but don't want to overdo it on the starchy carbs. Surprisingly, this whole-wheat version of the previous pick on this list has more fat than its buttermilk counterpart! (It also has more carbs and sugar, but that's likely due to the fact that the p-cakes are topped with banana slices.) It does offer up some additional fiber, though; the choice is yours. This one barely qualifies for Simple & Fit status, with stats approaching the 600-calorie mark. Not the worst thing on the menu, but hardly the best. The pancakes are loaded with blueberries and topped with sliced banana, and they come with a side of scrambled egg substitute. Better than most pancake combos on the menu, so it's worth considering if you're jonesing for something special. HG FYI: All of the pancake platters at IHOP are pretty high in sodium. So if that's a concern, skip 'em altogether. Your best bet is the Half Turkey Sandwich, which has 290 calories... and 18g fat. We're guessing that fat count is the fault of the mayo -- if you order this, ask for mustard instead! Then pair it with one of the above soup or salad picks. This sounds super-tasty: chicken breast and veggies in a balsamic glaze, with steamed broccoli and a house salad with that reduced-fat Italian dressing. Maybe we should consider IHOP as a lunch or dinner destination! If your pals are frequent IHOP visitors, consider this their new passport. Click "Send to a Friend" to help 'em eat smart! It's National Jelly-Filled Donut Day, June 8th. WAIT! Regular ol' National Donut Day was just a week ago -- who plans these things? In case you missed it, click here for that day's donut guide, featuring our very own Jelly-Filled Cupcakes as a swap!